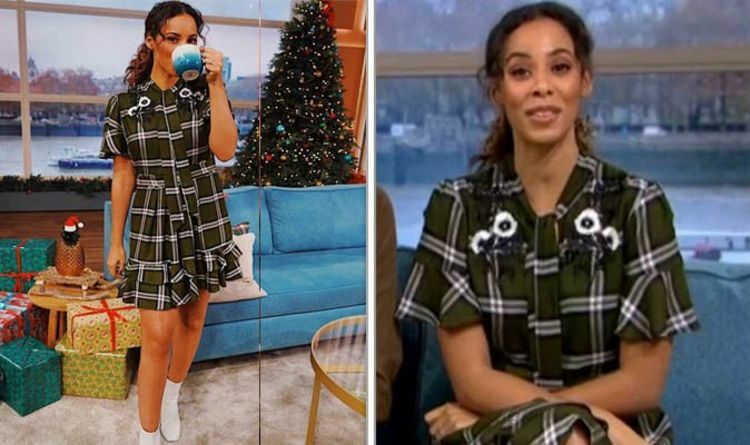 On today’s edition of This Morning Rochelle showed off her toned legs in a green plaid ruffle dress. The wild west style of her dress is a look also favoured by Holly Willoughby in the jungle. Rochelle paired her dress with her favourite go to heeled boots. She wore her hair up with a few loose curls and minimal makeup. Before the ITV show began today Rochelle took to Instagram to share with her 1.2 million followers where they could also get the look. Her short dress costs £138 and is by designer Ranna Gill. Her fans can find the dress online at Anthropolgie. Whilst Rochelle usually wears more affordable options from the British High street, today she choose to champion an independent designer. She paired the short dress with her go to heeled boots from Office for £75. Yesterday on This Morning Rochelle wowed fans in a mixed floral and leopard print dress. Her dress was from All Saints, a brand that Rochelle has worn frequently during her time on ITV. She often wears their floaty dresses with a belt cinched in at the waist, showing off her slender figure. Yesterday she paired the dress with a belt from Black and Brown London. She completed the look with boots from Miss Selfridge. Rochelle regularly shares with her fans what she’s up to when not filming This Morning. Both Rochelle and Emma are ambassadors for M&S food. With the I’m a Celebrity final on Sunday meaning Holly’s eminent return to This Morning, Rochelle will be looking to get stuck in with other exciting projects. Golden Globes 2019 nominations: FULL LIST – who will be up for awards?